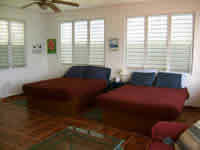 Rincon villa in Rincon, Puerto Rico - The Villa Orleans in Rincon, Puerto Rico: enchanting Caribbean beachfront home in the country, perfect for nature lovers seeking a quiet retreat. It is large and spacious for couples traveling together or a large family. In Rincon, Puerto Rico, Villa Orleans is an enchanting Caribbean beachfront vacation villa hidden in the country, perfect for nature lovers seeking a quiet seaside retreat. It is large and spacious for friends traveling together or a large family. 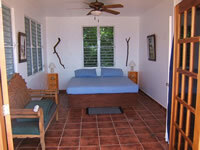 It has elegance, comfort, and privacy, hidden on one of the most quiet beaches in Puerto Rico. Villa Orleans is your tropical beachfront house, home or villa. 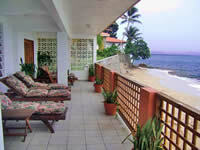 This beachfront villa has 3 air conditioned bedrooms and they open up to the balconies overlooking the seashore. It has 2.5 bathrooms inside, and another full bathroom outside. 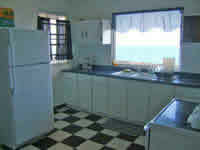 It has full kitchen and a large stainless steal bar-b-que and you have the choice of eating inside in the dinning room, or outside, on the picnic table in the terraza. It has everything you need to prepare a snack or a thanksgiving dinner. And if you don't feel like cooking, we have a Swiss chef who works with us and prepares exquisite reasonably priced meals. She'll bring them to the villa or prepare them there. This villa has a laundry room with washer/dryer. There are several sun decks with beach chairs, a covered balcony with more beach chairs and a terraza. It is equipped with Wi-Fi, cable modem and cable TV, so you can work or simply relax. There is an another one bedroom apartment over the art gallery if you need more space. 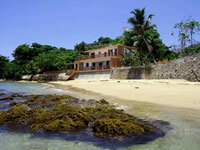 This oceanfront villa sits on a seawall on the Caribbean side of Rincon. This beach is calmer than the Atlantic, and has reefs which keep currents at bay. We own almost a kilometer strip in front of the beach, which was once part of the old train route that circled the island. There's always a sandy beach in front of this villa. This beach is nice for children for most of the year. During the winter cold fronts occasionally bring surfing waves of up to 5 feet. We're family friendly. We have a nice children's library, dvd collection, board games and beach toys (balls, noodles, boogie boards) for keeping the kids entertained. We've had families of 4 generations visiting. The downstairs bedroom is senior citizen friendly. It sports a half bath with stainless steel hand railing and two queen beds. This vacation home is surrounded by lush gardens (jungle) with many varieties of ginger, bromeliads, dracaena to name a few; and many tropical fruit trees, among them mango, bananas, star fruit, guanabana, lemons, avocado, pudding fruit, and coconuts. We're 30 minutes from Aguadilla Borinquen Airport (code BQN), 10 minutes from the center of Rincon, surfing beaches and restaurants. In Rincon you can go diving, deep sea fishing, snorkeling, kayaking, jet skiing, parasailing, banana boat riding, surfing, whale watching, swimming, sailing, or simply relaxing. There is a golf course in Aguadilla; a zoo in Mayaguez. Most beach rental shops are 10 to 15 minutes away. Rincon is a small beach town located on the western side of Puerto Rico with a population of 14,000. It has become a popular tourist area because of surfing, beaches, diving and fishing. Its tourist season starts around Thanksgiving and continues to Labor Day. There are many fine restaurants and shops in Rincon, and plenty of things to do. Things to do in Rincon: jet skiing, golf, kayaking, snorkeling, deep sea fishing, para sailing, tennis, horseback riding, surfing, whale watching , scuba diving and yoga.